Introduction: Many hospitals now have surgeons who are willing to perform complex procedures formerly undertaken in only a few specialist institutions. Not all of these hospitals have anaesthesiologist with training in paediatric cardiovascular anaesthesia. In order to provide safe anaesthesia for children with congenital heart disease, the anaesthesiologist must have a detailed understanding of the pathophysiology of the lesion and the pharmacology of drugs being used. The Ductus Arteriosus (PDA) is a persistent foetal communication from the main pulmonary artery (PA) to the descending aorta. The incidence of this defect is <?xml:namespace prefix = st1 ns = "urn:schemas-microsoft-com:office:smarttags" />1 in 2500 live full-term births, accounting for approximately 10% of all congenital heart defects. Anatomy: The isolated PDA arises from the anterior surface of the main pulmonary artery near its junction with the left pulmonary artery and joins the posterior descending aorta after the origin of the left subclavian artery. The shunt between the aorta and the PA can be restrictive or non restrictive. The magnitude and direction of flow are determined by the pressure in the aorta and resistance to flow in the two vascular beds, pulmonary and systemic. With non-restrictive PDA, the normal low pulmonary vascular resistance leads to an increased pulmonary blood flow and rise in pulmonary vascular pressures while systemic blood flow is frequently reduced. 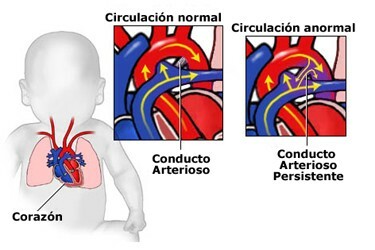 Pathophysiology: At birth, several important changes occur in the heart and peripheral circulation. The circulation of the newborn infant is in transition from the foetal to the adult pattern. It can be shift back to the foetal pattern by the presence of congenital heart disease, prematurity, anaesthesia, hypoxia and other conditions. Shunting through the PDA and across the foramen ovale is characteristic of foetal circulation. After birth and the cessation of placental circulation, an increase in systemic vascular resistance occurs. Pulmonary vascular resistance decreases 75 % and pulmonary blood flow increase 450 % with the beginning of neonatal respiration. From a prenatal pressure of 70/45, the pulmonary artery pressure decrease to 50/30 at 24 hours after birth and to 30/ 12 a few days later. 1 Vasoactive drugs, including bradykinin, prostaglandins and endothelium derived relaxing factor contribute to pulmonary vasodilation. Oxygen and ventilation contributes to increases in the release of these substances.